Jet 14" Bandsaw fence not square to table, ideas on aligning? 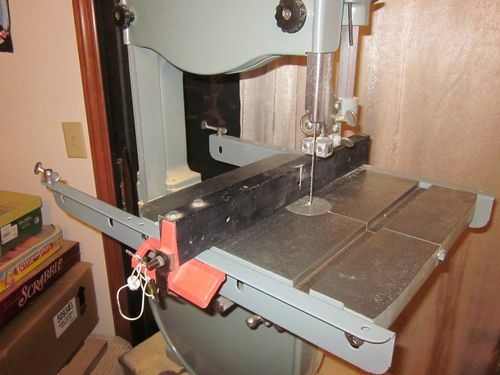 I picked up a used 14” Jet bandsaw while back. Cuts great but I noticed the fence if measured in the front and back to the miter slot are not the same. It out about a 1/8” in back (behind the blade). I thought it was a fence issue so I bought and installed the kreg fence. Still out. Don’t I want the fence to measure the same the miter slot anywhere along the fence? How do I do this? I’m thinking the trunnions bolts need to be loosened and the table moved a little. Ummm… the fence attaches to the table, right? So loosening the trunnions and moving the table won’t accomplish much. There should be a way to align the fence itself, however I don’t have one as a reference, so I can’t help you with that. But IMO, it’s not all that important. Heck, I have a POS homemade fence I scavenged off an old Ohio Forge benchtop table saw, and made rails from left-over table mounting angle iron from a RAS upgrade. Bandsaws never cut square with the table. you have to set the fence for blade drift. Whatever the case, it certainly isn’t as important to have fence line up with the blade as it is with a tablesaw. If, as you say, the saw cuts great I,d probably leave it alone. But if you want to adjust it you can probably shim the fence rails out on one side or the other.